Olympic Stadium In Montreal Turned Into Welcome Center For Refugees From U.S. : The Two-Way Asylum seekers have flooded from the U.S. to Quebec — mostly Haitians, worried about their status under the Trump Administration. Now a famous stadium is equipped with cots to help handle the surge. Olympic Stadium In Montreal Turned Into Welcome Center For Refugees From U.S.
Montreal's iconic Olympic Stadium, photographed in 2012, is now providing housing for newly arrived asylum seekers entering Canada from the U.S. 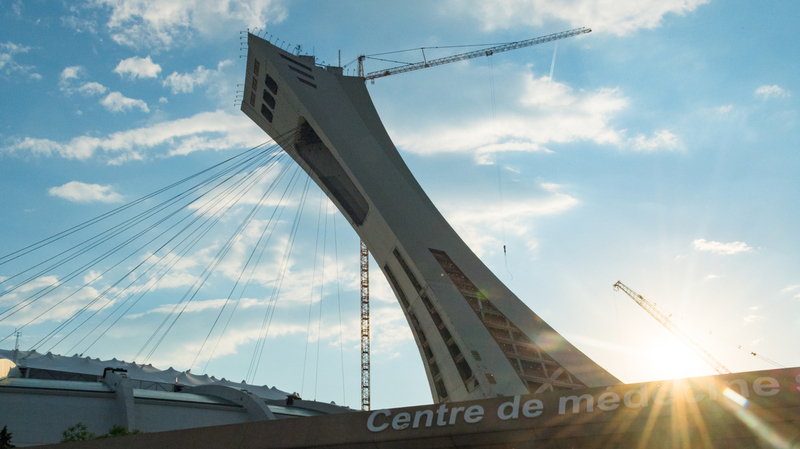 Faced with a flood of asylum seekers traveling from the United States into Quebec, Canada, local authorities have repurposed Montreal's Olympic Stadium and turned it into a refugee welcome center. A spokesperson for PRAIDA, the local government agency that helps refugees, tells the CBC more than 1,000 asylum seekers crossed the border into Quebec last month. "In comparison, PRAIDA helped 180 people in July 2016," the CBC writes. The vast majority of the asylum seekers are Haitians who initially fled the devastating earthquake in 2010, and whose future status in the U.S. is unclear under the Trump administration. The surge of refugees overwhelmed the YMCA facilities that are normally used to temporarily house new arrivals. So the agency turned to the Olympic Stadium — specifically, to the area by the concession stands, the CBC says. The first refugees to stay at the stadium were bused in on Wednesday, The Associated Press reports. "Volunteers from the Quebec Red Cross helped set up the cavernous, concrete stadium for a temporary stay with cots and food in the rotunda," the wire service writes. "The stadium was the main venue of the 1976 Olympics. It has not had a main tenant since the Montreal Expos left in 2004." The stadium will be hosting up to 450 people for several months, but cannot provide shelter permanently, given the event schedule, the AP says. "It took just 24 hours for the stadium – built in the 1970s as a venue for the city's 1976 Olympics – to be converted into a welcome centre where the asylum seekers will be sheltered and receive help in finding housing and completing paperwork related to their asylum claims. "So far, 150 cots – arranged neatly into rows among the concrete walls of a windowless area ... of the stadium – have been set up, along with access to showers and a cooking area." The Haitians who make up the majority of the new arrivals are in a precarious legal situation in the U.S. Tens of thousands of people fleeing the disastrous earthquake were given temporary protected status in the U.S. under the Obama administration; that's not the same as asylum or refugee status, but it acknowledges a person can't return to their home country safely. Homeland Security Extends Protections For Thousands Of Haitians In U.S. The Trump administration extended that status for just six months — and urged Haitian refugees to "prepare for and arrange their departure from the United States." The administration cited "Haiti's success in recovering from the earthquake," although Haiti continues to struggle with a number of crises, including an ongoing cholera epidemic, a nightmarish sewage problem and a catastrophic hurricane. That helps explain why a sudden surge of refugees are leaving the U.S. As to why they're entering Quebec, the CBC cites the large Haitian community in Montreal. "Obviously, there is a stronger attraction to coming to Quebec for Haitians than in other provinces," PRAIDA spokeswoman Francine Dupuis told the CBC. "They have the help of their community to get settled." But it's not clear if the Haitian refugees arriving in Canada will be permitted to stay, the CBC reports. The challenge is fundamentally the same as in America: A government evaluation of just how bad life is in Haiti. "Asylum seekers originally from Haiti who have crossed the Canada-U.S. border could be deported back to Haiti if their application is refused because Canadian authorities deem Haiti as a sufficiently safe country," the CBC writes.